This compact nylon daily kit includes one large capacity four cavity pill box in a convenient and durable nylon case. The MedCenter daily XL pill organizer clips easily to your bag, purse or attaches to your belt through the integrated belt loop or attached plastic clip. The daily xl pack is available with or without a 5-alarm watch making remembering your meds an easier part of your routine. 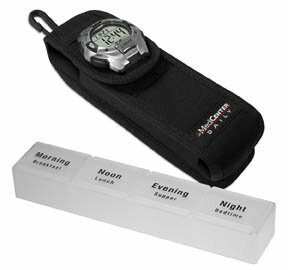 The kit also works directly with the MedCenter vitamin organizer and all of our large capacity pill box sized products. Velcro flap allows for quick access to pill box holds one large capacity daily pill box (included) with four cavities marked with the time of the day5-alarm clock with backlit display and multiple digital functions our new larger xl pill boxes (used in all products denoting the "xl" size pill boxes, also available as an accessory to the existing MedCenter system) have an individual dose compartment which measures roughly 1 3/8" wide x 1" long x 3/4" deep on the inside. Each of the new xl pill boxes contain four of these dose compartments.